Second in a two-part series. Click here to read the first part. Sitting on a dais in the U.N. headquarters in New York, the actor told an audience of international diplomats that Barbuda, a tiny island devastated by a Category 5 storm weeks earlier, in September, badly needed their help. "We have a humanitarian crisis — an entire island destroyed," said De Niro. "We must act together to help the most vulnerable, the ones affected by disaster and vulnerable to the effects of climate change. "We must stand with Barbuda and the Barbudans," he added, noting their need for water, power, housing repairs and help in getting schools open in the wake of Hurricane Irma, which badly damaged an estimated 95 percent of the island's structures. De Niro knows the island well. He and partner James Packer plan to build a sprawling luxury resort on the island in a deserted hotel once frequented by Princess Diana. In the wake of Irma, they promised to persevere in building Paradise Found Nobu as a show of solidarity with the locals. But the actor has also been criticized for advancing a controversial tourist project as many of the island's residents remain unable to return to their damaged homes almost six months after the storm struck. "I implore all countries and agencies to give, and ensure for Barbudans home and paradise is not lost," De Niro declared at the Sept. 18 high-level forum at the U.N. General Assembly. It wasn't the only time De Niro had spoken about climate change, nor was it the last. Earlier this month, the actor journeyed to the United Arab Emirates to launch a two-year project aimed at helping poor countries finance their climate projects. He used the appearance to take a jab at President Trump, who seems to reject climate change, but also to boost Barbuda. "If a country is strong, people will want to invest," De Niro said. "In Barbuda, we're there to help, to bring back what they had before." But six months after Irma, Barbuda's recovery is lagging. Many houses still don't have water and lights, schools remain officially closed, and fewer than 400 of the island's 1,800 residents have returned home after a mandatory evacuation to Antigua last fall. Those who have returned often have to stay in damaged homes, when they can, or in tents in their front yards. Prime Minister Gaston Browne, who resides in Antigua, has called them "squatters." Browne has been outspoken about the islanders' plight in appearances outside his own country, encouraging world sympathy and help for the people he calls victims of climate change. "We're living the consequences of climate change," the prime minister told CNN in September. "It is a worrying thing," Sir Ronald Sanders, the country's ambassador to the United States, said in a forum co-hosted by Oxfam America last November in Washington, D.C. "An entire civilization that has existed for three centuries is no longer there. "And this, I suspect, portends things to come if climate change is not curbed," he noted. The world responded to De Niro by reaching for its collective checkbook. A November pledging conference at U.N. headquarters saw countries ranging from China to Serbia promise to provide $1.35 billion for all of the islands affected by Irma and Hurricane Maria, which followed weeks later. The U.N. estimate for Barbuda's recovery was $220 million. Some of these resources have already materialized. China has spent $2.5 million on Barbudan recovery, channeling most of its largesse through the U.N. Development Programme. Antigua and Barbuda also received a $7 million payout from the Caribbean Catastrophe Risk Insurance Facility for Irma, and Browne has publicly acknowledged receiving money and supplies from the European Union, United Kingdom, Venezuela, Canada and others. But Browne, who is also the country's finance minister, has declined to give a full accounting of the global contribution to Barbuda's recovery or say why progress has been so slow. The prime minister's office and finance ministry did not respond to calls to comment for this story. Sen. Arthur Nibbs, Barbuda's senator and a Browne ally, told E&E News that he believed the government would provide a full accounting of Irma aid when possible, "and you must trust us on that." Not all of the finances provided by third parties have been received, he noted, and not all of the money will be administered by the Antiguan and Barbudan government — making tabulation difficult. But Browne and Nibbs say whatever that international contribution is, it won't be enough. Browne said in a recent PBS report, "Clearly the homeowners have to have some skin in the game." Since Barbudan landownership rules don't give residents a title to their land, they can't hold mortgages to finance rebuilding. Browne proposes to fix that and to make Barbuda a more business-friendly place, by swapping the island's cooperative ownership structure for a freeholder system that would allow off-islanders to purchase and control land on the island. Barbudan activists oppose that plan. "How can you be telling people that in order for them to be able to rebuild their houses, they have to sell land because there is no money to do it, when you have collected donor money for that exact purpose?" asked John Mussington, principal of Barbuda's secondary school and an outspoken critic of Browne's government. Browne is advancing a legislative proposal that would let islanders purchase the plot of land adjacent to their homes for $1, with rights to sell it outside the Barbudan community — something that is currently not permitted by law. Nibbs said the proposal, introduced in December, came about because Irma recovery will be so costly. "That's the only reason why it turned up now as opposed to anytime else," he said. Nibbs, who hopes to be re-elected on March 21, vehemently denied that Browne's landownership changes would put an end to communal use of the island. "I don't know why it's put in the press all over the world, 'Oh, people are not going to be able to hunt; people are not going to be able to fish,'" he said in an interview. "That's utter nonsense. All the amendment is going to do is an additional right that Barbudans never had. Barbudans never had ownership." Browne's amendment would allow native Barbudans to buy 10,000 square feet around their homes for $1. But it would also allow De Niro and Packer to buy their 555-acre Paradise Found lease site for $1, under the terms of a memorandum of understanding De Niro and Packer signed with Browne's government in 2014. 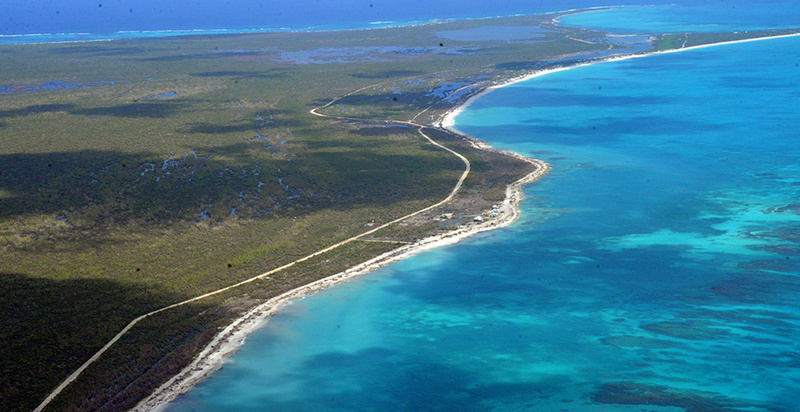 The Paradise Found Act circumvented Barbudan land law to grant the two businessmen a 198-year lease — twice the usual length. It's being challenged legally, and the country's high court announced last week it would hear the case. Meanwhile, some locals are offended that work is progressing on a new airport runway, to serve Barbuda's burgeoning tourism industry, even as the overall recovery effort drags along. Nibbs said the new runway is supported by private commercial capital and has "nothing at all to do with relief funds." Paradise Found put up $5.2 million for the new runway, according to the 2014 MOU. Nibbs said the rest came from another investor he refused to name. The need is clear, he said, given that the island's current airport is too small to accommodate small commercial jets. "We're promoting Barbuda as a five-star destination," he said. "We want to be able to open up Barbuda to the world so that we can be exposed and so that we can open up a port of entry." Nobu, the management company responsible for Paradise Found, declined to comment for this story. De Niro's publicist did not respond to requests. Paradise Found submitted an application to build in April. That was followed by an environmental impact analysis in June. But the analysis is now being rewritten to incorporate the impacts of Irma, and the Antiguan and Barbudan planning authority said no building permit had yet been issued for the project. One Barbudan doesn't blame De Niro for trying to capitalize on the island's beautiful scenery, saying that's just business. Instead, she criticizes the government for not protecting its people. "De Niro's a businessman; what can I say?" said Diann Jeffers, who now lives in the Bronx. "He's an investor, he's a businessman; of course if he sees a good deal, he's going to go for it, right?" The government, she said, are "the people you put in power to speak for you" and to ensure that the islanders are not "taken advantage of."